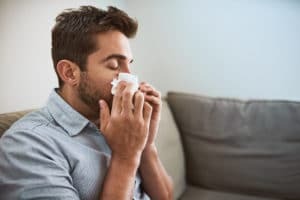 Is the Air Quality in Your Brooklyn Home Making You Sick? Does it surprise you to hear that pollutants inside your home can be even more harmful than pollutants outside it? The EPA estimates that city dwellers, especially, spend 90 percent of their time indoors, so it makes sense to pay attention to indoor air quality. Brooklyn homes can harbor all sorts of air pollutants including dust mites, chemicals like solvents and cleaning agents, secondhand smoke, and mold and mildew. These problems can be even worse in winter when our homes are sealed up tight against the cold. Pollutants can build to dangerous levels if steps aren’t taken to remove them. Health effects from poor indoor air quality include worsening asthma symptoms, headaches, fatigue and more. Along with proper cleaning, removing pollutants, and correct storage of chemicals, maintaining and upgrading your HVAC system can vastly improve the air quality in your Brooklyn home, and Petri Plumbing & Heating can help. Here are some products and services to consider if you are concerned about indoor air quality. A professional HVAC inspection and tune-up can go a long way towards improving the air quality in your home. Make sure the air circulating through your home is as clean as it can be. Our service experts can clean your HVAC unit of dust, mold or mildew. Duct cleaning, sanitation and video inspection can also help identify and eliminate indoor air quality problems. Be sure to choose a high-quality furnace filter and change it according to recommendations. Furnace filters keep dust from circulating around your home, and they help keep the HVAC system clean and operating smoothly and efficiently. Consider adding some backup for your furnace filter. A whole-home air cleaner will grab particles too small to get trapped by even the best furnace filter. Ultraviolet lamps can kill mold and bacteria inside your HVAC unit and sanitize the air before it circulates back into your home. At Petri Plumbing & Heating, we want all our Brooklyn neighbors to breathe easy at home and at work. We can diagnose and address your indoor air quality problems and clear the air in your home. Call us today at (718) 748-1254 to schedule inspection and maintenance for your HVAC system.